politician who was the first openly gay person to be elected to public office in California, as a member of the San Francisco Board of Supervisors. 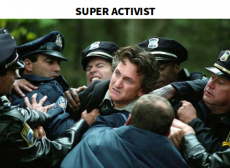 An activist is a person who believes strongly in political or social change and takes part in activities such as public protests to try to make this happen. Forms of activism range from writing letters to newspapers or to politicians, political campaigning, economic activism such as boycotts or preferentially patronizing businesses, rallies, street marches, strikes, sit-ins, and hunger strikes. Sean was a gay rights activist and politician who was the first openly gay person to be elected to public office in California, as a member of the San Francisco Board of Supervisors. Dissatisfied with his life and in need of a change, he and his boyfriend decided to move to San Francisco in the hope of finding larger acceptance of their relationship. They opened Castro Camera in the heart of Eureka Valley, a working-class neighborhood in the process of evolving into a predominantly gay neighborhood known as The Castro. Frustrated by the opposition they encountered in the once Irish-Catholic neighborhood, Sean utilized his background as a businessman to become a gay activist. Being a gay activist proved to be a "Risky Business." Sean clashed with the local gay "establishment" which he felt to be too cautious and risk-averse. He found himself at "Close Range" from the police who, at the time, raided gay bars and arrested patrons. Gays were treated like "Bad Boys" by the police. They were seen as "Crackers." In reality they were in a "State of Grace" and "Racing with the Moon", but that's something the police never quite understood. Sean launched an effort to defeat Proposition 6, an initiative on the California state ballot in November 1978. Sponsored by John Briggs, a conservative state legislator from Orange County, Proposition 6 seeked to ban gays and lesbians (in addition to anyone who supports them) from working in California's public schools. "ThisMust Be the Place" where gay rights have to start." He said, underlying that education was "The Tree of Life". Sean had an enemy, fellow Supervisor Dan White, a Vietnam veteran and former police officer and firefighter who eventually turned into "The Gunman" in the Moscone–Sean assassinations. Mayor Moscone had denied Dan request to be reinstated, after being lobbied by Sean. As a consequence of the murders the San Francisco Weekly referred to White as "perhaps the most hated man in San Francisco's history." Many in the gay community were outraged by the verdict and the resulting reduced prison sentence. Since Sean had been homosexual, many felt that homophobia had been a motivating factor in the jury's decision. However, White was paroled in 1984 and committed suicide less than two years later, which proved to be the right punishment. "What Just Happened" "Into the Wild" was no "Fair Game", but "Witch Hunt." "The Assassination of Richard Nixon" never occurred (Samuel Byck failed attempt) as he didn't fail in his effort to fight the enemies of America, the communists in Vietnam. The same cannot be said about John Kennedy openly berated for not doing enough to overthrow Castro, and for the failure of the invasion of Cuba in 1961 at the Bay of Pigs, in which many anti–Castro Cubans were killed. Beside, many senior members of the US armed forces wished Kennedy to be more aggressive toward the Soviet regime and the peasant uprisings in south–east Asia. It seems that a pacific and "passive" attitude in a warlike country like the United States is a dangerous business for a president. Sean didn't commit a sin by being gay. Jesus never said homosexuality was a sin. Christianity did. Sean's followers, who continued his fight till today, are true to his words. "I think that it is a good time for those who voted for the ban against gay marriage to sit and reflect and anticipate their great shame and the shame in their grandchildren's eyes if they continue that way of support. We've got to have equal rights for everyone"
Fighting for civil rights and equality will never be out of fashion. Dan White killed the man, not the message. "So if we have anything original to offer, it's to speak from our own life about the society we're in." It means, the changes have to come from inside. From inside your heart, your mind, your family, society and country... Never look for a change coming from outer space. "It's only in innocence you find any kind of magic, any kind of courage." It all comes from a pure heart. The source of love and greatness is innocent. "I think we all have light and dark inside us." The matter is a personal choice. To follow the light inside you, or the darkness. "There's a lot of mediocrity being celebrated, and a lot of wonderful stuff being ignored or discouraged." The mass media ignores many of these wonderful stuff. The mediocrity they celebrate to distract the public opinion, or to benefit political interests and big businesses has to stop. The mass has become too globalized, and it ended in a monopoly. "When everything gets answered, it's fake." Let life be a "Mystic River." Sometimes, no answer is the best answer. "So, goodnight Sean. You started in life humbly as a "Milk"man. But you will be remembered by "All the King's Men" at the San Francisco Pride." The Storie After Breaking Dawn! !